Better late than never (! 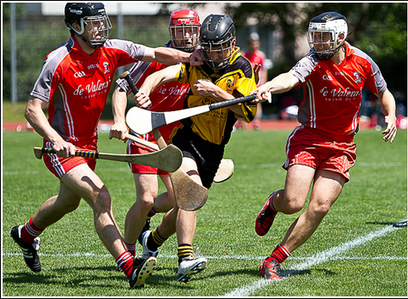 ), here is the official tournament report from the 11 July Hurling tournament in Zurich, where the men of Belgium sealed the European Championship title with a hard-fought victory. Many congratulations to the hurlers, who under the steady guiding hand of manager Martin Crowley have been unstoppable this season. Travelling great distances is a common feature when playing GAA in Europe & personally, I enjoy the ritual of it: Get up early, make the sandwiches, have a big breakfast & the n drive for hours to get some GAA, then head out, have a good time & then drive all the back on the Sunday; I couldn’t think of anything better to do on the weekend. The 1st Odyssey of this year (of which more will follow with the Football) was to Zurich to play Hurling. We had 4 cars going: Dennis (or Densor as we call him) & Aidan headed off on Friday evening. They were followed on the Saturday by Jarret, our Captain Kevin Keary & Pierce in 1 car; Willie, Conor, Dec & Martin in the other & finally Adrian, Eoghan & myself in the 3rd car. So off we left at about 5:30 to a foreign soil, to fight to claim the title of European Hurling Champions & to retain last year’s title, armed with lots of hurleys & more Air Guitar than you’ll find at a Status Quo, Whitesnake & Def Leppard concert! After the long drive through the beautiful surroundings of France & then Switzerland, we reached of destination of Zurich at about 1. First up, Zurich vs. Lux. A good game of hurling followed with Lux proving dangerous with the long ball into their full forward, Sully. Zurich have improved a lot from last year’s encounter & you can see a big improvement in both the men & ladies’ team…but we needed to beat the team-of-black to continue to the final. We came quickly into this game, with a strategy of using the ball well, taking our points & trying to avoid running with the ball as much as possible, due to the lack of numbers & the heat. Scorers for Belgie were Eoghan, Jarret, Pierce & Densor. 2nd half: Zurich let the head drop after a quick 2 points & 1 goal from the Belgians. Zurich still kept playing well, however, with a point from play. However, a retaliation of 2-2 from the Belgians finished the game off. Standout performances for Belgium were Pierce “The Moonwalker” O Caoimhe (watch him run with the sliotar; graceful), Eoghan Kelly & particularly Willie & Adrian being bothe excellent in the defence. Or so it was meant to be; Lux & us decided to play the final straight after the ladies game. So sitting in the shade, we devised our strategy for taking on Lux. For Lux, their danger man was Sully. A great catcher of the ball, he’d run at the defence & straight on goal. For this, we had Conor Alyward man-mark him, with Keary just behind to quickly clear any breaking ball. 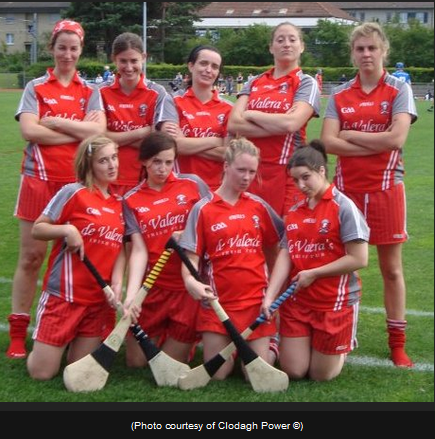 Lux also had a dnger woman in #4; a fantastic hurler from Galway. Willie was given the responsibility of marking her; we counted on his years of experience & also, as he’s getting married, we thought he’d like a chance to get physical with a 20-something college girl before the Big Day! Final change; we swapped Densor with Aidan, with the aim to bombard the Lux full back line so that Jarret & Aidan could recover the breaking ball. Densor was also to drag his man out into the wings, opening up the half-forward line to allow our midfield more room to assist in attack. Explaining what was needed from each of us, we focused on the game at hand. Just like against Zurich, we literally exploded (!) into this game, getting scoring 1-1. Our strategy for Densor was working brilliantly as it caused Pierce’s man to being dragged out also, in the hope of covering both men. However, it wasn’t all plain sailing. Lux let a long ball in which Martin blocked down as it was heading over the crossbar. Then, from nowhere, #4 rushed in to put the ball in the back of the net. 1-1 to 1-0. This was a moment of truth for Belgium; keep the head up or face defeat. The next 2 puck-outs were sent sailing over the bar by the Belgian’s: the perfect reply to Lux’s goal. Lux replied with1 point but Belgium, surely displaying the largest display of artillery in Europe since the 1940’s, finished the 1st half with a goal after barraging the Lux back line. 2nd half; Belgium opened quickly with 1 point but then we entered a War of Attrition. Lux kept to the strategy of the land ball into Sully. At 1 stage, he caught the pucked outed ball & was clear on goal. Keary had to react, pulling him down. Penalty!…except the ref had stopped play after Jarret had been in an incident just before the puck-out. The ref reset the game from that puck-out. Belgium had just snatched a lifeline: had that penalty counted, we would have a hard fight on our hands. Those last few minutes were tough; we had women swearing at us, hurls flying & breaking & at one stage Adrian verbally assaulting a young lady for holding on to his hurl…was tense stuff. But inspired by the Trojan men which each of the Belgians are, we never dropped the head. We put over 2 more points, before Lux’s #4 got a great point from play to bring the game to a close. It was a great victory for Belgium, considering we had minimal numbers & had trekked 650km to play. Also, with exception of Pierce, Kevin & Eoghan, our team were all over 30. I find that the most inspiring thing about these lads-I hope to still have even a tiny bit of what drives these men when I get to that stage; something like that says a lot about these lads. During the day, there were amazing performances all round. No heads dropped; concentration was always kept, even when it was tense in the final. I think everyone can agree that Eoghan Kelly’s performance was epic. I remember at 1 stage he was in the defence, driving a ball out of there, only to catch the returning ball & driving it over for a point. It was a great display from the man. Densor stepped forward to help us out, even though he hasn’t played hurling in years. He ended up scoring 1-1 in the tournament; a great display from the man. So next for the Belgians is The Hague in a few weeks. We are currently European Hurling Champions for this year but with the epic men we have playing, maybe a Grand Slam is on the cards for Belgium Hurling?